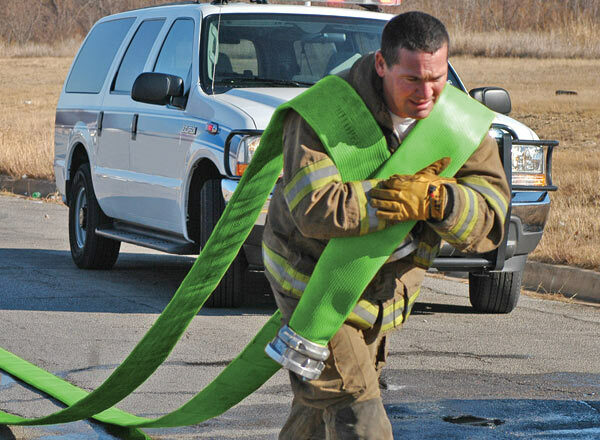 A high pressure, high visibility, large diameter attack/supply hose with a 300 psi service test pressure. Heat and chemical resistant, the nitrile/PVC through-the-weave design allows the hose to expand under pressure — decreasing friction loss and increasing water flow. The thin rib rubber outer cover offers increased resistance to impact, punctures and abrasion. 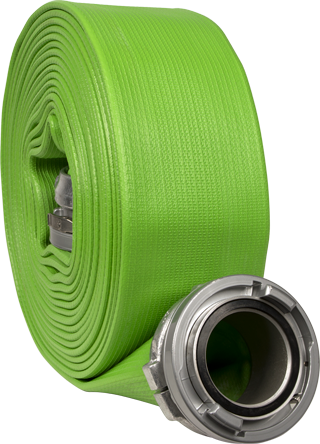 Reliable, maintenance-free and no drying required, make this the ideal supply hose for busy municipal fire departments. NFPA compliant and UL Listed. Pro-Flow HP is made from 100% high tenacity synthetic polyester yarn, circularly woven and completely protected by a through-the-weave extruded PVC/Nitrile rubber, forming a single homogeneous construction without the use of glues or adhesives of any type. Pro-Flow HP is guaranteed to withstand 10,000 cycles on the Taber Abrasion Machine (H-22 Wheel: 0.5 kg) without exposing the liner. Engineered to perform in any environment, Pro-Flow HP can withstand surface temperatures from 1200 ºF to -35 ºF. Pro-Flow HP coupling options are as required by purchaser, expansion ring threaded, Storz clamp ring, etc. Pro-Flow HP meets or exceeds requirements of NFPA 1961. Pro-Flow HP hose shall carry a 10-year written warranty against defects in materials and workmanship. © 2019 Key Hose, a KFH Industries Company. All Rights Reserved.